This list of Pilgrimage Site are the Verso Ministries Top Pilgrimage Sites in Region 3. The Regions that will be used for all of our lists are based off of the Regions used by the National Federation for Catholic Youth Ministry (NFCYM) and used for the Bishop Conferences. These resources are here for Youth Groups, Young Adults, and Individuals to be able to find local sites to go on Pilgrimage to. The National Shrine of Our Lady of Czestochowa was founded in 1955 by the Pauline Fathers as a Shrine honoring the patroness of Poland. As a sort of spiritual home for Polish-American Catholics, this Shrine dives deep into the heart of America’s roots as a nation of immigrants. The Shrine has many chapels for prayer and over 100 acres of grounds to walk, however the crowning glory of the Shrine is the image of Our Lady of Czestochowa. This image was blessed by Pope John XXIII and gifted by him to the Shrine in 1962 and it has since drawn pilgrims from all over the world. I strongly encourage you to visit this gem in eastern Pennsylvania and to honor the patroness of Pope Saint John Paul the Great, a man who himself visited this exact Shrine twice before he became Pope. The National Blue Army Shrine of Our Lady of Fatima was built in 1978 in honor of the Marian apparitions in Fatima. The goal of the Shrine is to spread devotion to the Immaculate Heart of Mary in order to draw people closer to Christ through His mother’s love. The most spiritually invigorating spot on this site is the Capelinha which is one of only two exact replicas in the world of the chapel in Fatima dedicated to the apparition. Being fully identical to the chapel in Fatima, this is the best opportunity for people who are unable to travel abroad to experience the beauty of Our Lady of Fatima. There are also a wide range of Saint statues that you can pray at throughout the grounds, so anybody with a special devotion to Padre Pio, Saint Francis, or any other of a number of Saints will have a friend they can visit there. You should definitely make this place a destination for a pilgrimage for yourself, your family, or your group as it will have a place of prayer for everybody. The grounds are also more than big enough to spread out on in order to find your own place to pray that will become like a small spiritual home for yourself. This Shrine is home to the Sisters of the Blessed Sacrament, the Order founded by Saint Katharine Drexel in 1891. The Sisters of the Order dedicate their lives through the Eucharist to the feeding of the hungry of both spirit and body throughout the world. At the heart of their life, and the heart of any pilgrimage to the Shrine, is the Saint Elizabeth Chapel. The chapel was named in honor of Saint Katharine’s sister Elizabeth and has become the focal point since its construction in 1892 for the Sisters as they work in their ministries. During your visit you will have the opportunity to pray in this chapel, learn from the sisters and their museum about Saint Katharine, and most importantly pray at her tomb. This is the ultimate encounter with a Saint and is the opportunity of a lifetime to be able to ask for Saint Katharine’s intercession! As a final note, you will need to reach out in advance to the Sisters if you are to visit, but that can easily be done through their website. Perhaps the most unique group of Religious Sisters on this list, the Sisters of Saint Basil the Great are a Byzantine Catholic Order who first came to the United States in 1911. 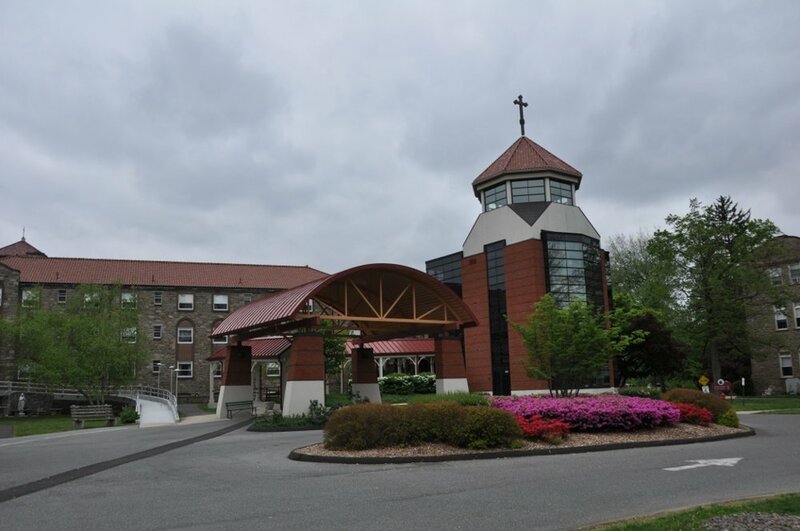 Their ministry is now mainly centered around the nursing home that they run (Macrina Manor) as well as the hosting of the yearly pilgrimage in honor of Our Lady of Perpetual Help. The pilgrimage takes place annually during Labor Day Weekend. The weekend is packed with spiritually charged events as well as community oriented events. I strongly encourage that anybody with a devotion to the Blessed Mother or a desire to continue ecumenical worship with our Eastern brothers and sisters join in on this pilgrimage. The Byzantine Catholics are in full communion with Rome and the beauty of their liturgical celebrations are something that every Catholic should experience at least once in their life. The love for the Mary should inspire us to join in on this pilgrimage and the devotion that our eastern brothers and sisters have for her should build up our own devotion. So go on this pilgrimage and find a deeper love for the Virgin Mary and experience something new! Hacklebarney State Park is one of the hidden treasures of northern New Jersey. Found in the heart of Long Valley, Hacklebarney has trails throughout the wooded area with the most popular going along the river that can be found there. The backwoods of New Jersey have always been a personal favorite of mine, and the opportunity to hike along these trails always brings out the child in me. Nothing is more fun than running along the rocks in the river, trying to keep your feet dry, while crossing back and forth. The waterfall at the end is the perfect spot to sit at and pray evening prayer as the sun sets. With picnic tables and small grills, there is always the opportunity to have your own meal with your group while taking in the beauty of Creation all around you!